Want to generate more leads and sales via Facebook ads? Copy & paste our 7 proven Facebook ad campaigns to create low-cost, high-converting campaigns today. Click here to download! Congratulations! You’ve got a brand new subscriber to your email list! … as they will ever be. After all, they just gave you their email address. According to a study by Experian, Welcome Emails are 4 times more likely to be opened and nearly 7 times more likely to get a click than other promotional mailings. 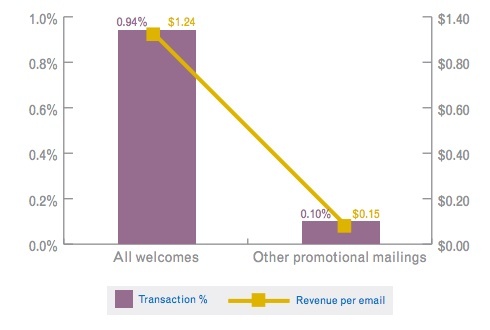 And, as if the high open and click rates aren’t enough, the transaction rate and revenue per email of a Welcome Email is over 9 times that of other promotional mailings. 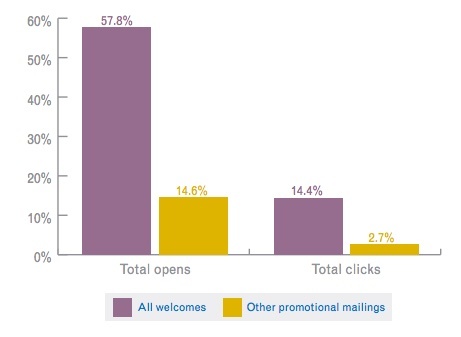 At DigitalMarketer, our Welcome Email is 6 times more likely to get opened than the typical promotional email. These numbers are astounding! Your Welcome Email presents a tremendous opportunity. Now is the time to welcome that new subscriber. Now is the time to “wow” them. Now is the time for Indoctrination. The role of Indoctrination in your email marketing is to welcome new subscribers by telling them what they can expect and what they need to do next to get the greatest benefit from you and your brand. It is only sent to new subscribers that have never been on your email list. After all, you wouldn’t introduce yourself to someone you’ve already met. That would be…awkward. Your new subscriber may not recognize your name (or your brand name) in their inbox, and they aren’t necessarily expecting an email from you. You have no relationship with that subscriber…yet. Your Indoctrination Campaign will begin to build that relationship. 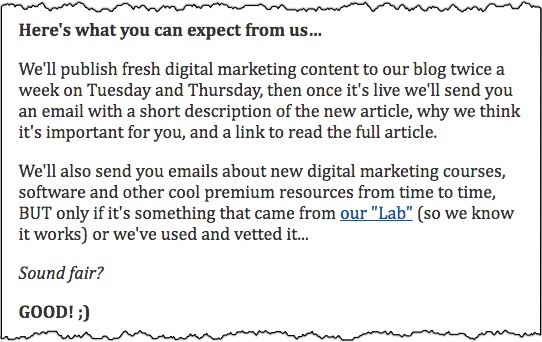 Let’s have a look at DigitalMarketer’s Welcome Email. I recommend you read it all the way through the first time. Pay close attention to each part of the email. Then, see below where I break down the nuances of each chunk of copy. The subject line should be straight forward. Just as you would when you meet someone for the first time in the physical world, the opening should be conversational and welcoming. 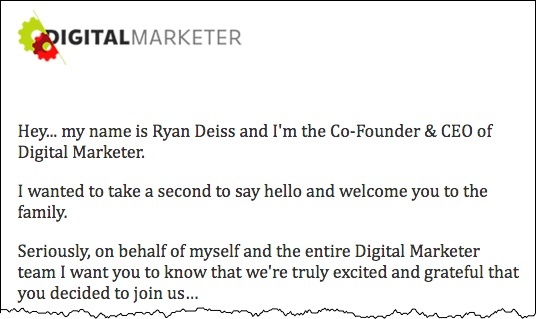 Notice how Ryan (DigitalMarketer’s CEO and Co-Founder) introduces himself with an almost folksy tone. Stay true to your brand here, and you can’t go wrong. In this section, we set expectations and restate the upside to being a DigitalMarketer subscriber. They have given you their email address. What will you give them in return? When will you give it to them? Will you send them content? Will you invite them to exclusive events? Will you send them exclusive offers? Connect the dots for your subscriber. Don’t assume they know (or remember) why being a member of your email list is beneficial to them. Make promises and be sure to keep them. Remember, this is a relationship, and good relationships are built on trust. We devote a sizable portion of the Welcome Email to next steps. 1. Whitelist our emails – Notice how detailed our instructions are regarding whitelisting. First, the act of complying with our instructions to whitelist our emails is a micro commitment. These small commitments from the subscriber are important because, in the future, we will be asking them to make bigger commitments. Second, whitelisting our email (even if only one out of 10 complies) does wonders for our person-to-person email deliverability. 2. Connect with us on social media – Again, complying with our instructions to connect with us on Facebook or Twitter demonstrates a micro commitment on the part of the subscriber. Second, each new social media connection we make from our Welcome Email represents increased reach and frequency of our marketing. Not to mention that we like our customers and subscribers, and being connected with them on social media is pretty cool in and of itself. BONUS: Want to see the structure of a good whitelisting instructions page? Click here to see ours. This is optional but opening “loops” in your email in general, and your Welcome Email in particular, will do wonders for your engagement rates. The P.S. in this Welcome Email teases the emails we will be sending over the next few days to the new subscriber. 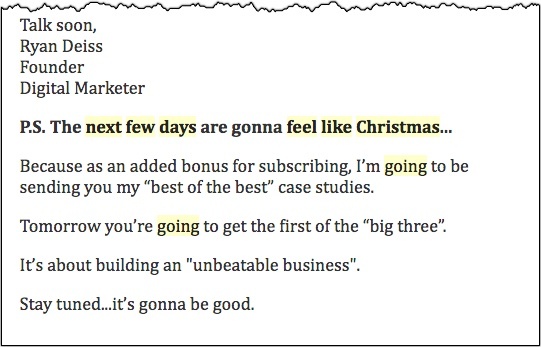 By teasing these future emails, the subscriber anticipates them over the following days. As a result, open rates go up. This P.S. also allows you to transform your Indoctrination Campaign into a true series of emails. As a result, you’ll be increasing the connection with your subscriber and driving traffic to your best content. Talk about putting your best foot forward! Then, simply articulate the benefit of the content you are sending them and drop a link. Bonus points if you use these follow-up emails to further tell the story of your company, your mission, and your core values. Remember, the Indoctrination Campaign is about welcoming your new subscriber. It’s about intentionally building a relationship with that new subscriber and setting the stage for that new relationship.